Richard Drake. 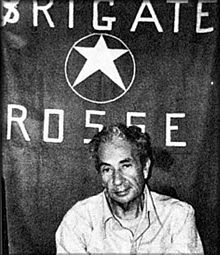 The Aldo Moro Murder Case. 波士顿: 哈佛大学出版社. 1996年. ISBN 0674014812. ^ 7.0 7.1 Popham, Peter. The seance that came back to haunt Romano Prodi（反过来追踪罗马诺·普罗迪的降神会）. 独立报. 2005年12月2日 [2008年11月28日]. ^ Giovanni Fasanella和Alberto Franceschini，《Che cosa sono le Red Brigades》（红色旅是谁）2005年，ISBN 978-2-7557-0020-6. ^ 10.0 10.1 Moore, Malcolm. US envoy admits role in Aldo Moro killing（美国承认参与阿尔多·莫罗被杀案）. 每日电讯报. [2008年11月12日].